The vikings or Varangians were traders, settlers (and most certainly pirates after many unsuccessful ventures) from Scandinavia who in the years between 800 and 1050 colonized, raided and traded the lengths of the coasts, rivers and islands of Europe and the northeastern shores of North America. They called themselves Norsemen (Northmen) (modern Scandinavians still refer to themselves as the people of the North, nordbor). Their ruthlessness and courage in battle is well-documented, but they also built settlements and were skilled craftsmen and traders. In Russia and the Byzantine Empire, the vikings were known as Varangians (Væringjar, meaning "sworn men"), and the Scandinavian bodyguards of the Byzantine emperors were known as the Varangian Guard. Other names include Danes, Northmen, Norseman Germanians and Normans. The modern day nations descended from the vikings are Icelanders, Norwegians, Danes, Swedes and Faroe Islanders. The etymology is somewhat unclear. One path might be from the old Norse word 'vík', meaning 'bay', 'creek' or 'inlet', and the suffix '-ing', meaning 'coming from' or 'belonging to'. Thus, "vikings" would be 'people of the creeks', especially in the area Viken. Later on, the term became synonymous with 'raider of the sea'. The word "vikingr" ("vikings") appears on several rune stones found in Scandinavia. However, it was mentioned for the very first time in the ancient Anglo-Saxon poem "Widsith" from the 6th or 7th century. Hence, the second path suggested steems from Old English wíc, i.e. "trading city", (from latin vic, "village"). Even a third path is suggested, where viking comes from avviker ("dissenter"); that is "mariners that left (avviker) from home". According to the Swedish writer Jan Guillou, the word in its positive sense was popularized by Erik Gustaf Geijer in the poem The Viking, written at the beginning of the 19th century. Now, the word was taken to signify brave sea warriors who had very little to do with the politics shared by the actual vikings in the Catholic history. This change of meaning was however, quite political: a myth about a glorious and brave past was needed to give the Swedes the courage to retake Finland, which had been lost in 1809 during the war between Sweden and Russia. Finland had belonged to the kingdom of Sweden for about 600 years. The Geatish Society, of which Geijer was a member, popularized this myth to a great extent. 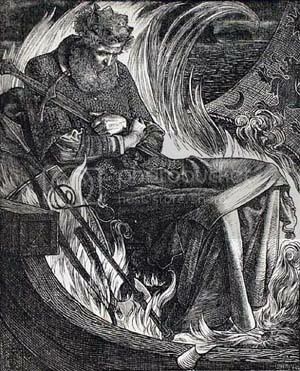 Another author who had great a influence on the perception of the Vikings was Esaias Tegnér, another member of the Geatish Society who wrote a modern version of Frithiofs Saga, which became widely popular in the nordic countries, the United Kingdom and Germany. The viking propensity for trade is easily seen in large towns such as Hedeby; close to the border with the Franks, it was effectively a crossroads between the cultures until its eventual destruction by the Norwegians in an internecine dispute around the year 1050. 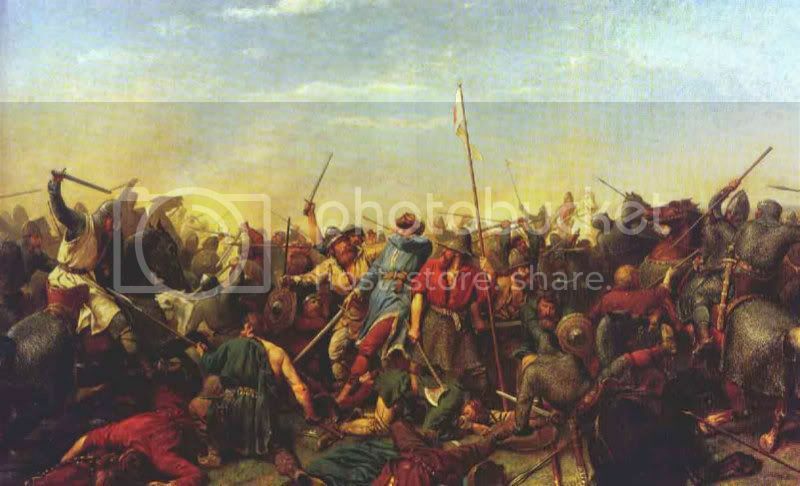 The earliest date given for a Viking raid is 789, when according to the Anglo Saxon Chronicle, Portland was attacked. A more reliable report dates from 793, when the monastery at Lindisfarne on the east coast of England was pillaged by foreign seafarers. For the next 200 years, European history is filled with tales of Vikings and their plundering. Vikings exerted influence throughout the coastal areas of Ireland and Scotland, and conquered large parts of England (see Danelaw). They travelled up the rivers of France and Spain, and gained control of areas in Russia and along the Baltic coast. Stories tell of raids in the Mediterranean and as far east as the Caspian Sea. The Vikings founded cities such as Jorvik (York), Kyiv and Dublin. The Danes sailed south, to Friesland, France and the southern parts of England. In the years 1013-1016, Canute the Great succeeded to the English throne. The Swedes sailed to east into Russia, where Rurik founded the first Russian state, and on the rivers south to the Black Sea, Constantinople and the Byzantine Empire. The Norwegians travelled to the north-west and west, to the Faroes, Shetland, Orkney, Ireland and the northern parts of England. Apart from Britain and Ireland, Norwegians mostly found largely uninhabited land and established settlements. In about the year 1000 A.D, North America was discovered by Bjarni Herjólfsson. Leif Ericsson and Þórfinnur Karlsefni from Greenland attempted to settle the land which they dubbed Vinland. A small settlement was placed on the northern peninsula of Newfoundland, near L'Anse aux Meadows, but previous inhabitants and a cold climate brought it to an end within a few years (see Freydís Eiríksdóttir). The archaeological remains are now a UN World Heritage Site. It has now been scientifically established that at the height of the Viking expansion, the northern hemisphere entered into a period of unusual and long-lasting cold which continued for several hundred years. This miniature ice age decimated the Greenland colonies, stopped the Viking westward expansion and hampered the Viking homelands. Besides allowing the Vikings to travel far distances, their longships gave them tactical advantages in battles. They could perform very efficient hit-and-run attacks, in which they attacked quickly and unexpectedly and left before a counter-offensive could be launched. Longships could also sail in shallow waters, allowing the Vikings to travel far inland along the rivers. A reason for the raids is believed by some to be overpopulation caused by technological advances such as the use of iron, although another cause could well be pressure caused by the Frankish expansion to the south of Scandinavia. For people living along the coast it seems natural to seek new land by sea. Another reason is that in that period several European countries (particularly England, Wales and Ireland) were in internal disarray and easy prey; the Franks, however, had well-defended coasts and heavily fortified ports and harbours. Pure thirst for adventure may also have been a factor. The use of the longships ended when technology changed and ships constructed using saws instead of axes. This led to a lesser quality of ships and together with an increasing centralisation of government in the Scandinavian countries, the old system of Leding---a fleet mobilization system, where every Skipen (ship community) had to deliver one ship and crew---was discontinued. Norse mythology and Old Norse literature tell us about their religion with heroic and mythological heroes; however, the transmission of this information was primarily oral and we are reliant upon the writings of (later) Christian scholars such as Snorri Sturluson and Sæmundur Fróði "the Wise" Sigfússon for much of this, both whom were Icelanders and an overwhelming amount of the sagas were written in Iceland. After decades of trade, settlement, and fighting over their right to be heathen in Christian lands, resistance in these parts of Europe became more effective and Christianity was introduced into Scandinavia, which led to suppressive tendencies toward enterprises under heathen banners, in order to assimilate into Europe easier. Apparently, going against the tide of influences of wealth from Rome did not appeal to some people, who eventually inherited the thrones in the North. Under the hand of the Christians, the kingdoms of Norway, Denmark and Sweden evolved out of power consolidation to only those who praised Christ and tipped their hats to the Pope. That was the way, some believed, to make the most profit, rather than put their lives on the line to be judged forfeit by an expanding power structure which resembled the Roman Empire. The Holy Roman Empire was its name around that time, and its borders were closer to home, so they became like the Germanic foederati of old Roman times. They would in turn, like the tribes South of them, adopt the Roman religion and banners, to convert and assimilate other peoples of the Baltic and Russian states. It was only the insular Scandinavian lands of the British Isles, Faeroes, Iceland, Greenland and Vinland which did not attempt to take other people's lands from them under a Christian banner, and pretty much tried to live locally during that time, sometimes asserting their right to secede from their former governments in their colonies, but generally adopting Christianity as a way of staving off the inevitable forced conversion by these former governments(such as Norway) and their newer ones(such as England, France, Russia), which made sure they would continue relations with them for trade and other economic reasons. There is no evidence whatsoever that the vikings on any occasion wore helmets with horns. This is a latter-day myth created by national romantic ideas in Sweden at the end of the 19th century, notably the Geatish Society, and further imprinted by cartoons like Hagar the Horrible or Asterix and numerous fictitious movies. The people living in Scandinavia during the Bronze Age did, however, wear horned helmets during ceremonies, as testified by rock carvings and actual finds. See Bohuslän. In order to build Odinism into a valid and inspiring religious expression we must overcome this tendency to trivialise divinity. The gods are not Vikings…they are spiritual beings, potent forces of numinous power"
I wonder what happened with the norwegians then as they are quite small now these days.. I read that most of the buriels found of graves dating back to that time are no higher than those of today. However I think people miss the social factor in this since today a person who is tall is noted for their height and is then disregard meanwhile someone with height in the past was seen as a valued asset in battle. Viking clans and berserker gangs valued strong, tall and determined warriors in their ranks and thus a charismatic and note-worthy leader like Ragnar would likely have a truley fearsome lot with him. Keep in mind most of what we know of the vikings as far as eye-witness accounts came from the Christians who were pillaged and I can only imagine how frighten that must have looked. None-the-less Denmark and Finland is said to have the tallest people in the world. As much as we consider "Norsemen" and "Vikings" synonymous, it is only this way because of those Norsemen who went a-viking, most Norsemen remained at home and participated in warfare on their own territory; the Viking raids were developed only as a way to alleviate strain on the growing populations in Scandinavia. Most Vikings should not be taken as representatives of Norse culture, since they themselves were of about the same moral and cultural persuasion as a 19th-century British boatswain. Rather, good examples of the strong, fierce, honourable, level-headed Norsemen are found in characters described in the Sagas. Wings/Horns on helmets= complete romanticist invention; there is absolutely no archaeological or textual evidence of this ever. Norse Queen= Shield maidens did not, in fact, go into battle but merely carried the men's battle raiment and played cheerleaders on the sidelines, so to speak. The earliest evidence of such encouragement of the troops is found in Tacitus. Axes= always single-headed and easy to wield, swords were atypical and there were basically three shield variants as they developed; the 9th century and 10th century saw perfectly round, Germanic shield; the late 10th and early 11th centuries saw shields which were rounded at the top and came to a point at the bottom, and by the 12th century Vikings had switched entirely to long semi-tower shields. οὐκ ἐμοῦ, ἀλλὰ τοῦ λόγου ἀκούσαντας ὁμολογεῖν σοφόν ἐστιν ἓν πάντα εἶναί. the Viking raids were developed only as a way to alleviate strain on the growing populations in Scandinavia. This I doubt. There were about 300.000 people living in Scandinavia in the Viking Age. Even with very primordial tools, there would've been plenty of free land to cultivate and use within a comfortable distance, more preferable than leaving much farther into other cultures and fight for already taken land. In fact I think it's pretty clear the raids at least began as warfare against the expanding church and cultural conversion, even if they may have developed into mere adventures for treasures. I wrote a little about this in an earlier post. In fact I think it's pretty clear the raids at least began as warfare against the expanding church and cultural conversion, even if they may have developed into mere adventures for treasures. The Viking raids started before the church even reached Scandinavia; they started because of limited social mobility and wealth distribution. The reason the Vikings hit churches has absolutely nothing to do with religion; the monasteries during the middle ages were outposts of material wealth that allowed for social mobility in early Scandinavian culture, that's the only reason they were hit so hard. 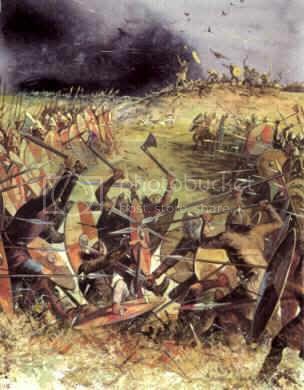 The fight against Christianity did not begin until much later, when the Norsemen came into regular contact with the religion through the already-converted Anglo-Saxons. 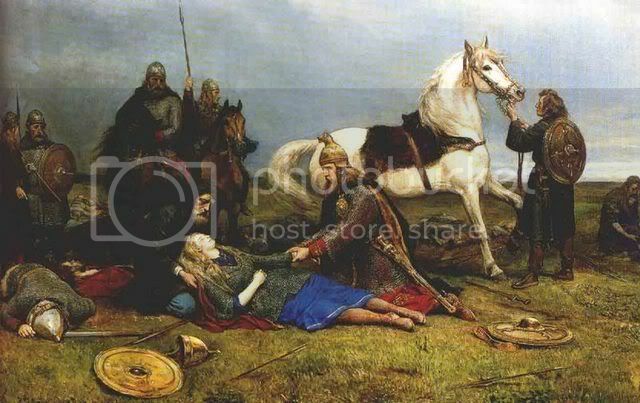 Norse kings converted for the same reasons as the Franks and Goths: politics. Some Kings resisted but active resistance did not begin until the 10th century, 200 years after Lindisfarne. Raids were never about culture or about conversion, they were done to keep the warrior keen and the coffers full so that the King had the resources to be as generous to his people as possible. The Norse had a very strong trickle-down economy, where a good Lord was generous to his retainers, but because of limited wealth it was necessary to keep these good Lords well-stocked with gold, silver, and other various material that they could reward loyalty with. Farming and land ownership to the ancients was far different than to modern people- a single man having a great deal of power over a single area would demand the population to spread and populate to keep the upward flow of social mobility active (in fact the Norse stand out for their tremendous upward social mobility). So yes, it was in fact a simple matter of population and economics that viking raids began. Actually many of the men who went out in viking lived in the more narrow fjords and viks. Atleast here in Norway.